The first years of Cleveland Jewish history were turbulent. The Israelitic Society split, and then came together again to build our city's first synagogue building in 1846, the Eagle Street Synagogue, only to split again in 1850. The group that left to form Congregation Tifereth Israel included Israel Kalisch, the rabbi. The cause of the split was religious issues. We know it was not about seating, for in 1855 Tifereth Israel would dedicate its own building with separate seating for women. Family pews would come later, in 1861. Tifereth Israel helped found The Union of American Hebrew Congregations. It was the only Cleveland congregation to attend the founding meeting on July 8, 1873 in Cincinnati, Ohio. See the July 25, 1873 issue of the American Israelite (pdf). (Anshe Chesed would join at the second meeting, in 1876.) The UAHC, today the URJ, in its early years was a diverse group that included radically progressive congregations, some that were traditional, and many whose customs fell between these extremes. The congregation's Hebrew name has always been Tifereth Israel (Glory of Israel). For more than a century it has been "The Temple." 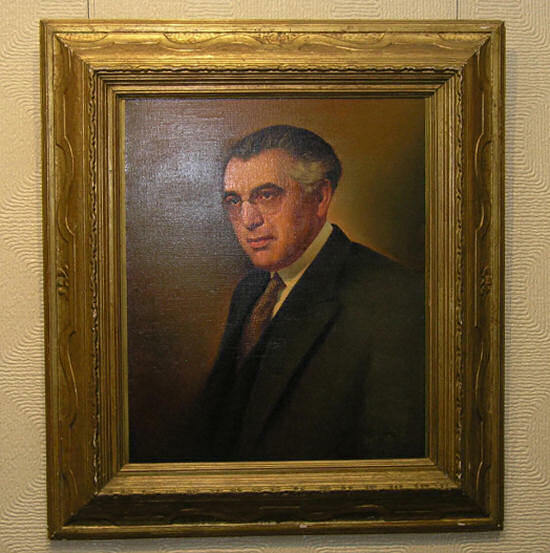 Older Clevelanders often say "Silver's Temple" because that's what it was often called when it was led for an incredible 46 years (1917-1963) by Rabbi Abba Hillel Silver. For more on Rabbi Silver, click here. 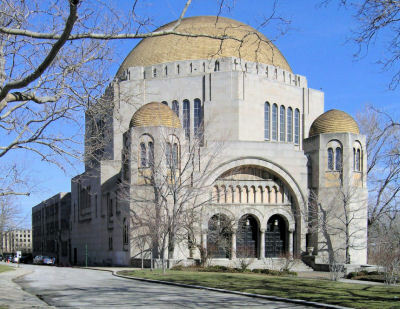 For more than 20 years it has used a combined name that respects its history: The Temple-Tifereth Israel. Sadly, in late 2006 when The Temple-Tifereth Israel enlarged its website, its History page no longer showed pictures of its former senior rabbis. You will find their images on our pages. For another aspect of this congregation's history, see Bud Weidenthal's Four Generations of Confirmations. For a much larger image, click here. 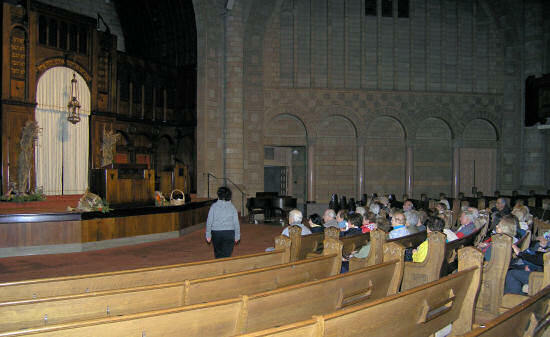 Sue Koletsky, Director of the Temple Museum, welcomes a group on a tour of old Jewish Cleveland led by Nate Arnold. The Sanctuary seats 1,800 persons in pews. 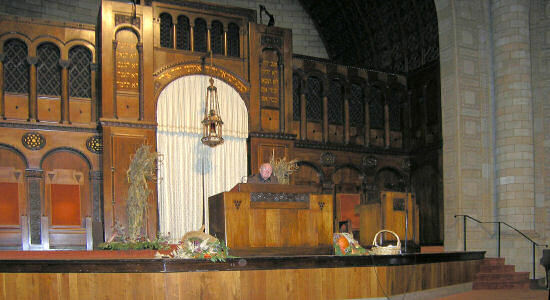 The Silver Sanctuary, named to honor the service of the father (Rabbi Abba Hillel Silver) and son (Rabbi Daniel Jeremy Silver) who spoke from this pulpit for a span of more than 70 years. In the Ark are four Torah scrolls, one a survivor of the Holocaust. We see an Eternal Light, the Ten Commandments and the "Shma". Above the Ark is a loft that was used by a professional choir and organist. Stained glass windows by Arthur Szyk (pronounced Shick), 1894-1951. Born in Poland and arriving here in 1940 to escape Hitler, Szyk was a great 20th century illuminator whose best-known work is his Haggadah. 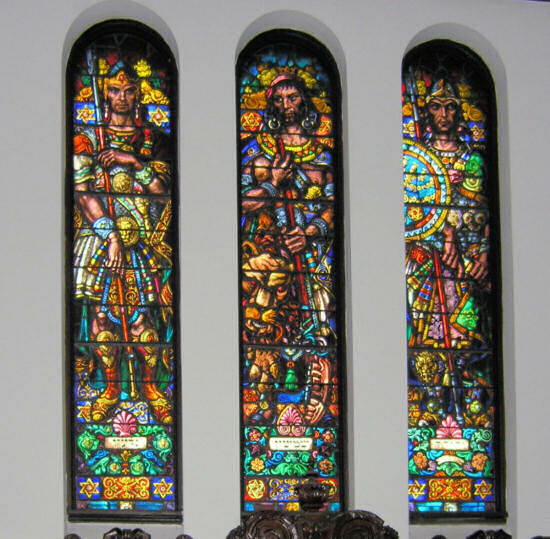 The windows, completed in 1947, portray three Jewish heroes: (l - r) Gideon, Samson and Judah Maccabee. Below the windows is a memorial to the 776 Temple men and women who served in the Armed Forces during World War II. More in a CJN story... For more of Szyk's work, visit this Library of Congress page. The Gries Memorial Chapel, named to honor Moses Gries, rabbi of The Temple from 1892 - 1917. This chapel was used for Friday evening services and other smaller ceremonies. The stained glass windows represent the Twelve Tribes of Israel. For a larger view of the certificate and badge, click here. For a larger view of the photograph on the right, click here. Portrait of Abba Hillel Silver painted by Sylvia Saul. 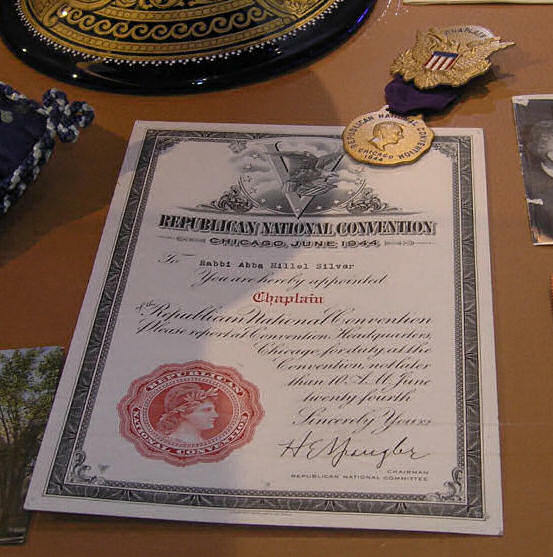 Silver memorabilia and portrait (and more than 1,000 other pieces) are at The Temple - Tifereth Israel Museum of Religious Art in Cleveland's University Circle. 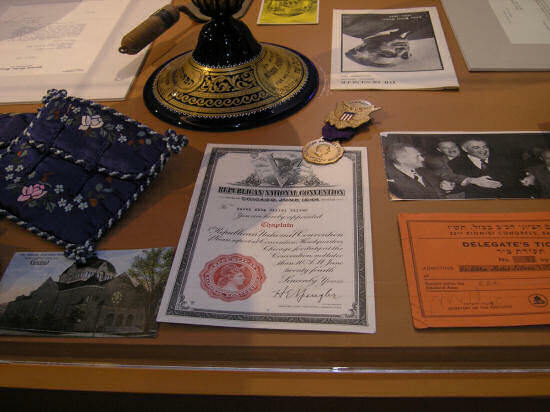 Founded in 1950 to commemorate The Temple's 100th birthday, it is one of the nation's first Judaica museums. Museum Director Sue Koletsky invites those who wish to tour the building and museum to contact her at (216) 831-3233 ext. 108. CSU's Sacred Landmarks website has a page on The Temple in which a geologist notes the wide variety of ancient creatures embedded in the stones used in the exterior and interior of this building. 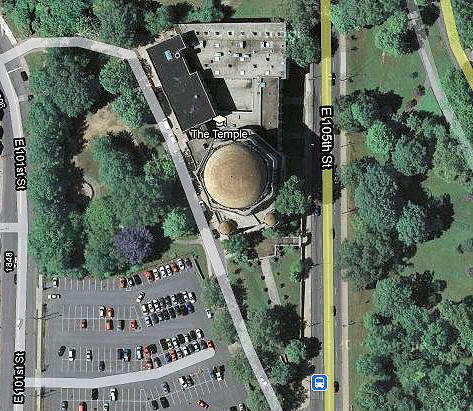 and remain sacred space for the families of The Temple - Tifereth Israel.